There is a crazy rumor floating around that the Easter Bunny may not be real. I know what you are thinking – that’s nonsense – and I couldn’t agree more! Really, you can’t believe everything you read in the tabloids. For those that still don’t believe that the Easter Bunny exists, I’m here to share with you some stories of Easter Bunny proof PLUS we have a free printable for Easter Bunny Poop. 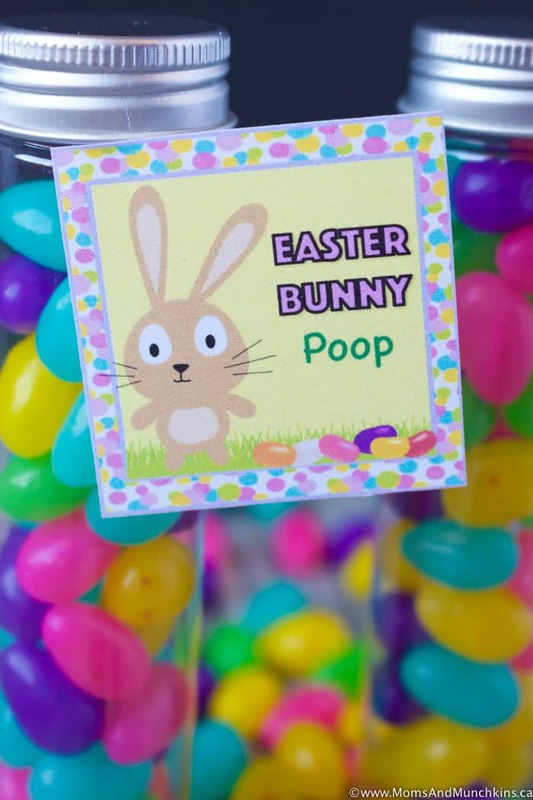 Gross, yes, but it is a cute idea for the kids to find on Easter morning! A trail of jelly beans is always a sure sign that the Easter Bunny has been to your house. Don’t eat the brown ones! I know they may look like chocolate covered raisins but it’s best not to touch the brown jelly beans. The Easter Bunny’s favorite food is carrots and I’m sure he’d appreciate you leaving some out for him on the night before Easter. If you find little chunks or shreds of carrots by your plate in the morning, that’s a sure sign of Easter Bunny proof. Whether it’s snow or mud, bunny footprints in your house will let you know that he stopped by for a visit. You could even follow these around the house to see everywhere that he stopped. If you want proof that the Easter Bunny exists, don’t be shy to ask him for proof yourself! Your children can write a Thank You note to leave for the Easter Bunny along with a request for an autograph. Have your little ones ever witnessed Easter Bunny proof? If so, what did they find? 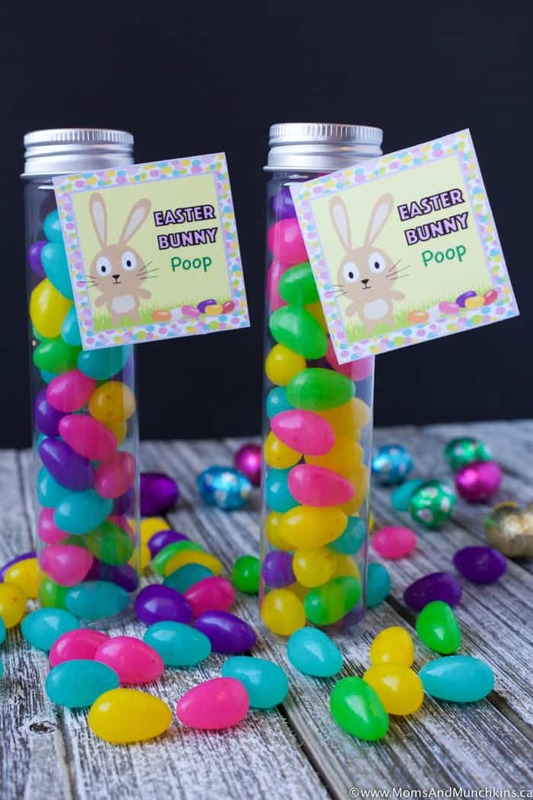 Don’t miss this cute Easter Bunny Poop tag – a cute treat idea for your kids to find on Easter morning! Want to try to catch a photo of the Easter Bunny in your house? Check out I Caught The Easter Bunny.com. For more Easter fun, visit our Easter page for loads of free printable games, treat ideas, activities, party ideas and more! We love holidays and that’s why we’re always sharing fun holiday ideas here with you! Follow us on Facebook, Twitter, Pinterest and Instagram. Digital clipart and paper provided by: Vorpal Vector, Yarko Design and Pixel Paper Prints. Absolutely fantastic Cheryl!! I have to say the first thing that caught my eye in that picture was the gorgeous floors and white cabinetry…hehe….Wishing you and your family a bunnyrific Easter! Aww, you’re too cute! Ha! Happy Easter to you, your hubby and your adorable little ones! That’s so cute, I love these. Helps keeps kids – kids for longer. Of course the Easter Bunny is real:) A trail of jelly beans is a great idea – but I think my pets would eat them. I can’t wait for our local Easter Egg hunt. Now that my son is old to “get it” I can’t wait to decorate and leave little bunny trailing’s behind. Ahaha! I love the jelly beans one! I remember one year our proof the Easter Bunny was real was when he left three of his relatives behind to be our pets! What a fun Easter! That’s so cool, we’ve never done the whole Easter bunny thing besides the egg hunt. This would be really fun to do! These are some really cute and fun ideas! Oh boy, are we ever! We’ve had a record snowfall this year (6 1/2 feet already) and no signs of stopping anytime soon! Thankfully we’re heading to Disneyland and Orange County soon. We are sure excited to see some sun and all the magical wonders of Disneyland! What rumors? How could anyone not possible believe in the Easter bunny? I love your ideas for proof! My kids would love that…if I could just get creative and hope that cat doesn’t ruin it. Thanks so much for linking up at my Real Family Fun link party.